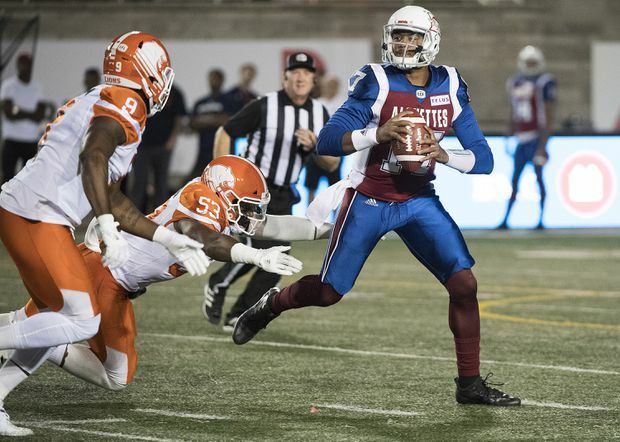 Montreal Alouettes quarterback Antonio Pipkin breaks away from BC Lions Jordan Herdman (53) and Shawn Lemon (9) in Montreal on Friday, Sept. 14, 2018. T.J. Lee and Anthony Orange had interceptions for fourth-quarter touchdowns to lift the B.C. Lions to their first road victory of the season, a 32-14 win over the Montreal Alouettes.